I recall sitting on a chair at Luch’s kitchen table one year, many years ago. Kids were outside playing in the yard. 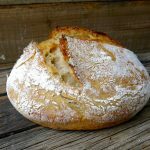 It might have been a baking day for us, or just a visiting day, but we found ourselves alone in the kitchen – just for a moment, and she whispered, “Guess what I have in the fridge?” Well, who would know? She is a fabulous cook. 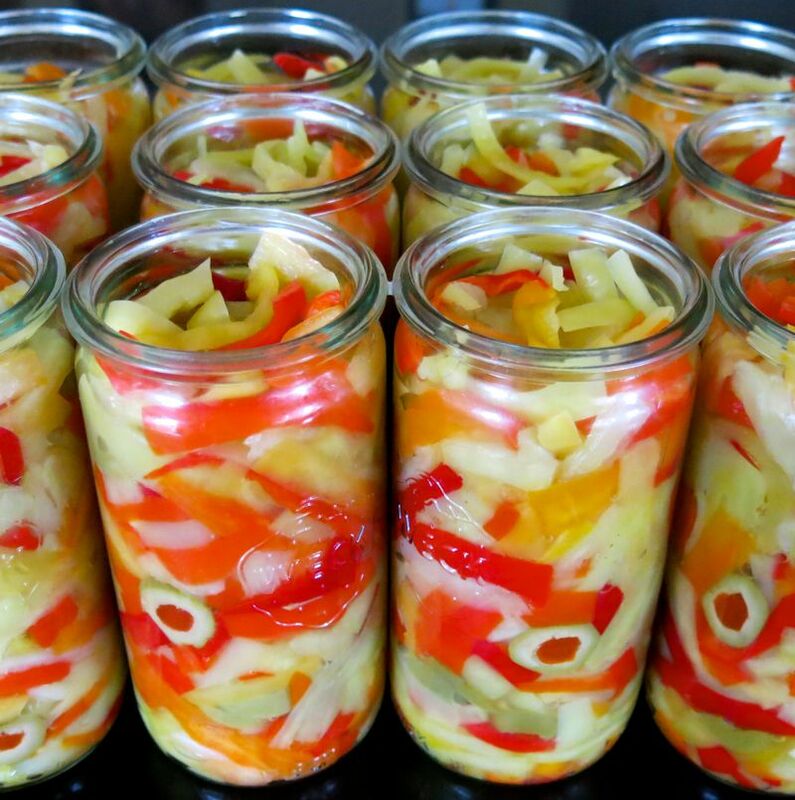 “A jar of my mom’s special giardiniera! 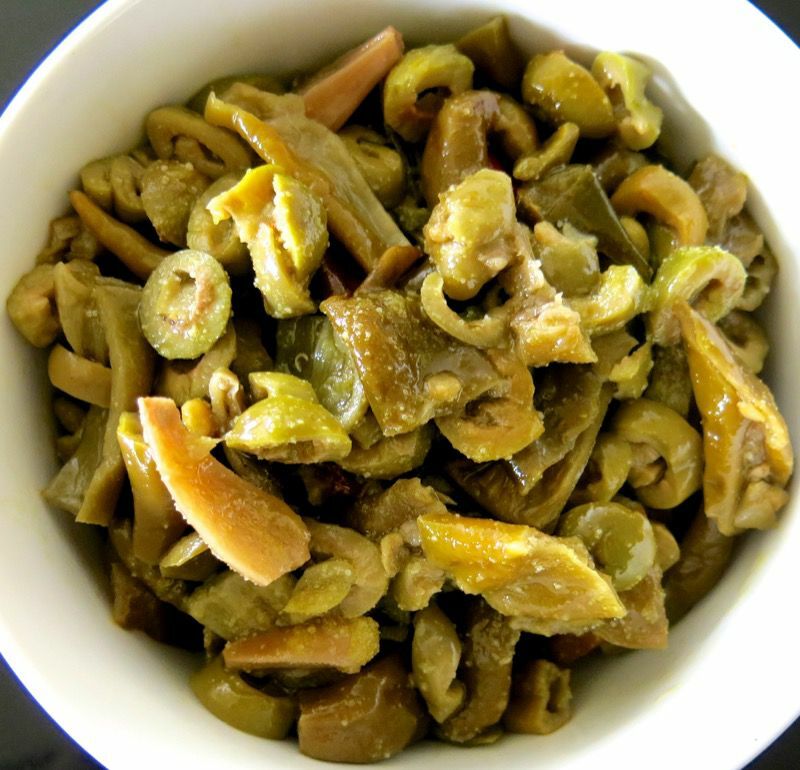 Shhh!” Finger to lips, she grinned, opened the fridge, and passed me the small, slender jar filled with deep green garden vegetable preserved in fragrant, fruity thick and lush olive oil. 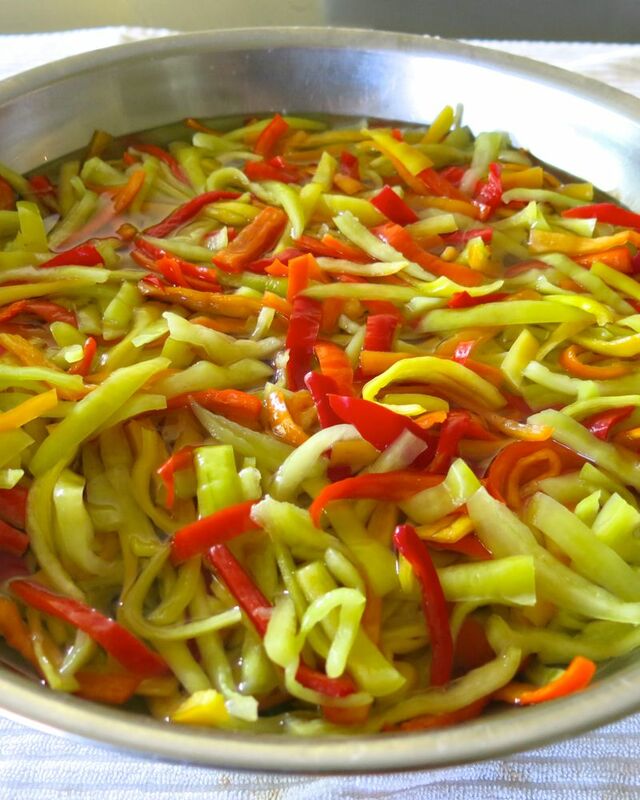 At that time, a variety of garden vegetables, mainly green, mainly peppers, a little spicy, in oil. An absolute pleasure. The kind of pleasure that seeps deep into the core of your being and rests within, warming your soul. An unforgettable pleasure. There was only a tiny bit out of the jar. “I’ve been sneaking some all week. No one even knows mom gave me this. ” Luch whispers. Luciana is a fantastic cook. Seriously. Yet, so is her mother. Not better as a cook, but better as a preserver of memory. 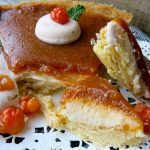 A preserver of the recipes the family brought with them many years ago when they emigrated from Puglia to Canada. 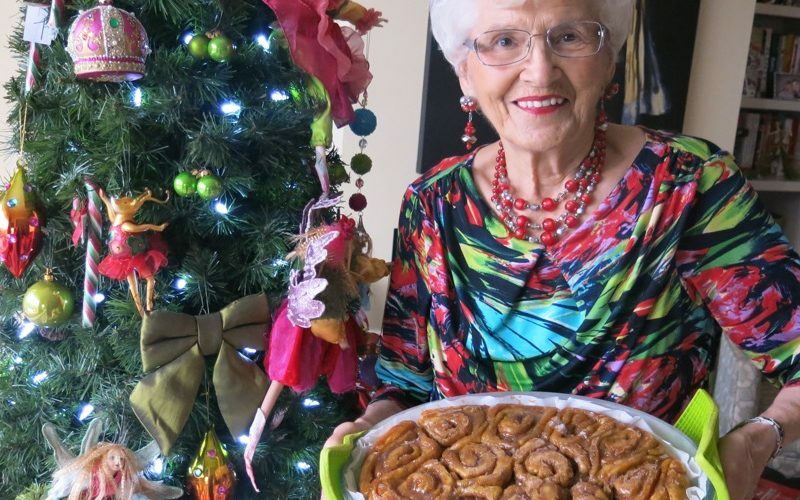 No one can replicate those recipes in this terroir better than Luciana’s mom and dad. He with his greenhouse; she with her apron. 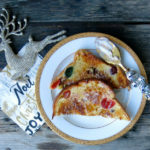 Together, they preserved the food from their past as they forged a new life for the future of their thriving young family. And today, nothing has changed. 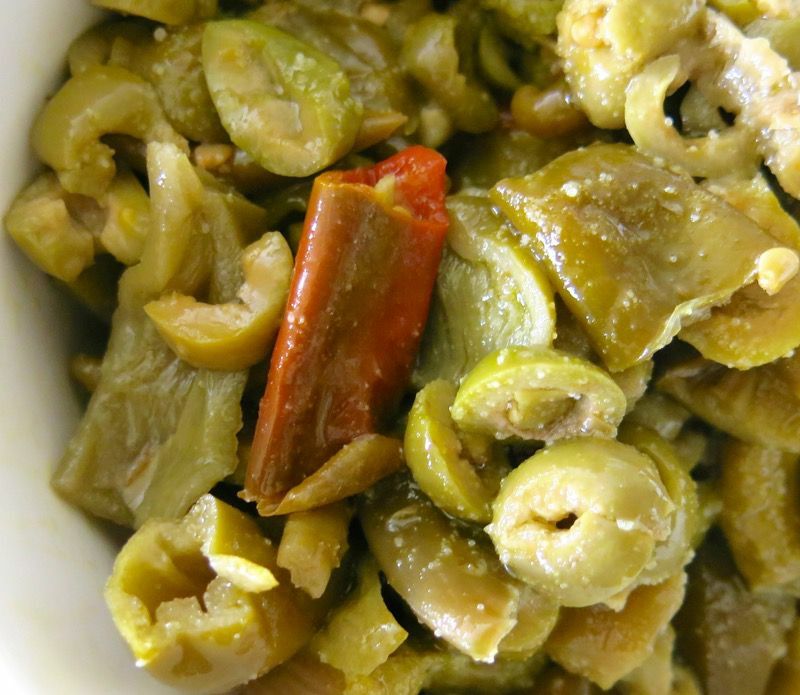 In July, Luciana’s dad harvested his unripened green Puglia pepperoncini, or banana peppers; the family converged upon his home, and together they made this giardiniera. He is now 93. Her mother is 10 years younger. 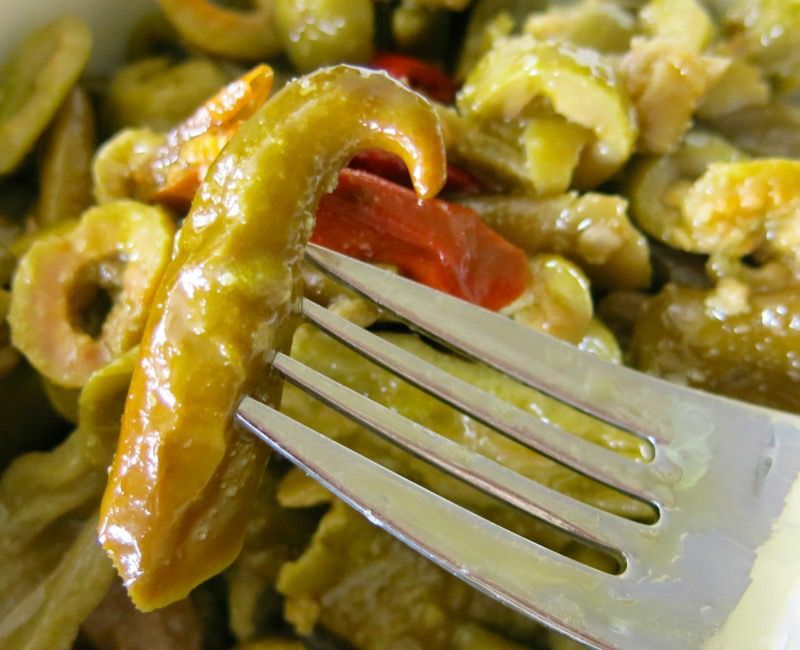 Everyone covets anything her mother makes, but especially her giardiniera. And, it wasn’t given away liberally, either. Saved for the most special occasions, I felt privileged to be able to “sneak a little from the jar”, too, as I pulled out a green bean. 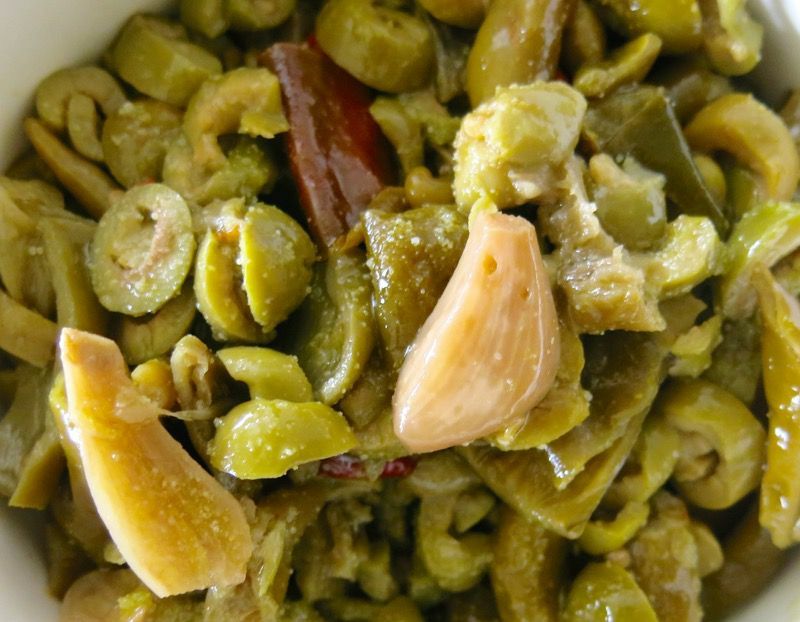 It is the best green bean I have eaten in my life. 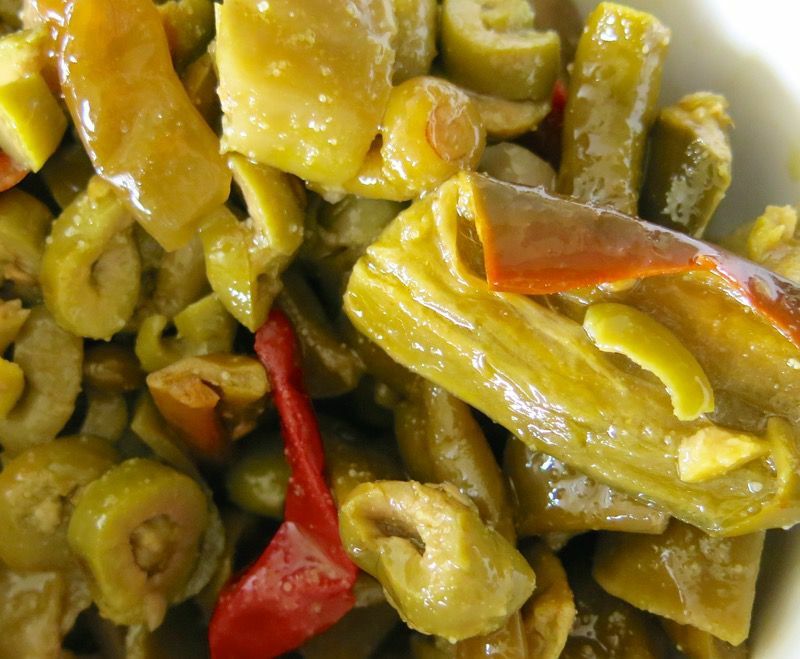 I have never forgotten that green bean, or that moment as both of us were hovering over her mother’s jar of homemade giardiniera savoring those flavours and marveling at Vittoria’s ability to make the simplest ingredients taste unimaginably delicious. 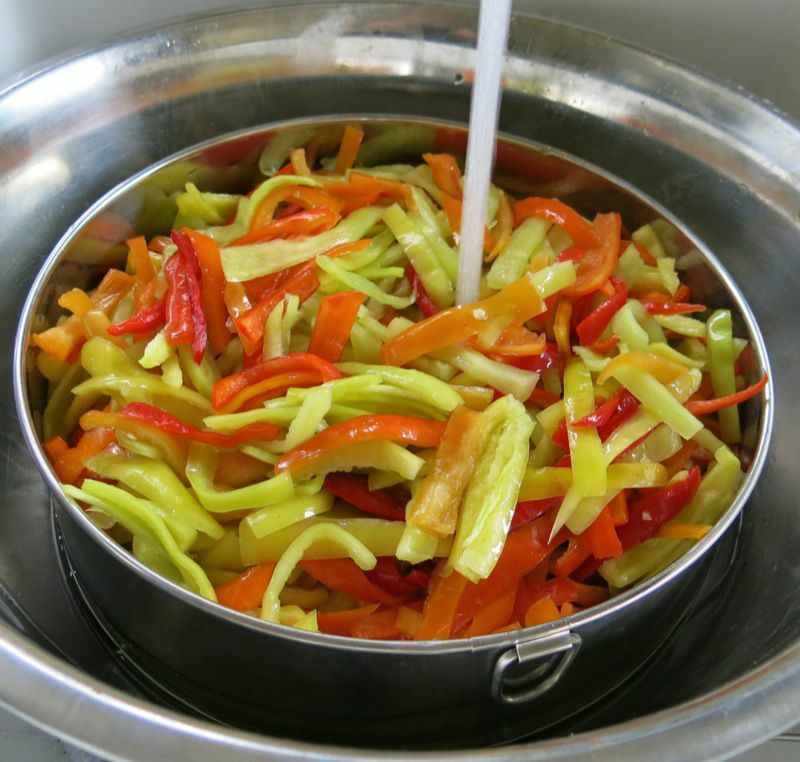 I have wanted to learn to make Vittoria’s giardiniera since that moment. Through the years, I implored Luciana many times to go to Red Deer and watch her mom and dad make it. But, apparently, Vittoria doesn’t tell her family when she plans to do what she does. She just does it. 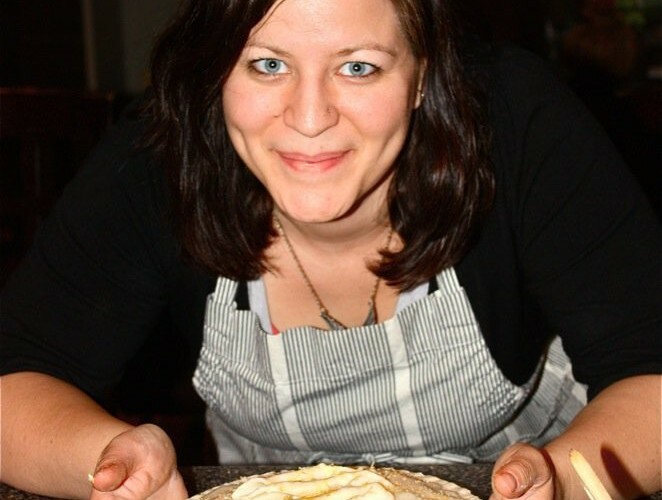 More importantly, Luciana told me that Vittoria doesn’t like other people in her kitchen when she is working….. sigh. My last trip to Italy, I was on a mission for Luciana’s dad. 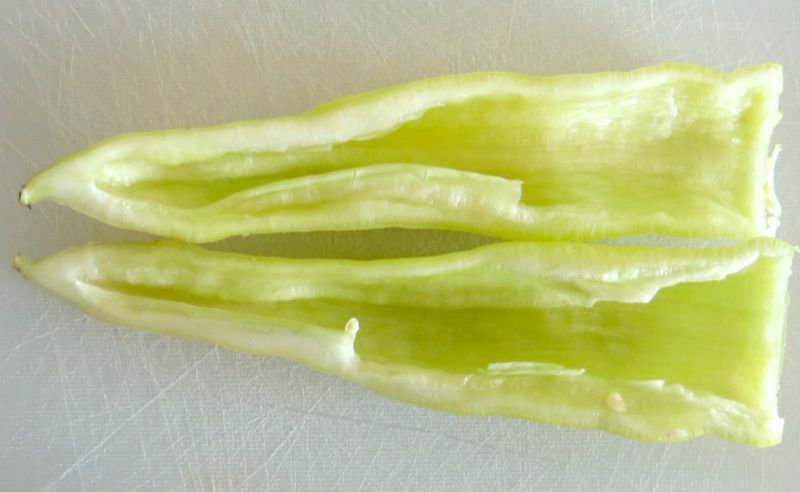 “Find the seeds for the sweet, green Puglia Pepperoncini (not a chile, a pepper).” Oh, how I tried. I learned the only place one can get these seeds is in Puglia. 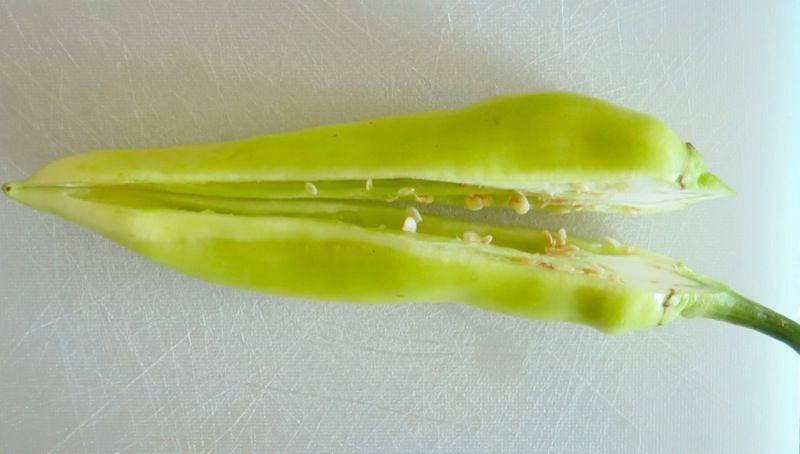 This year, Luciana found the “right peppers”, the Puglia sweet pepperoncini, at the Italian Centre Shops. Seriously? Seriously. 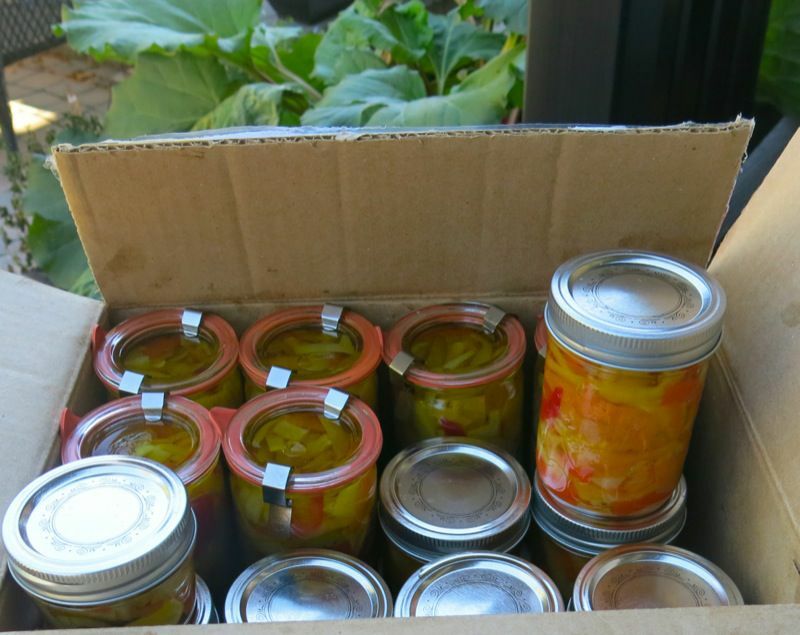 Tony, Luch’s dad, likes to preserve them when they are not yet ripe, and a vibrant green. 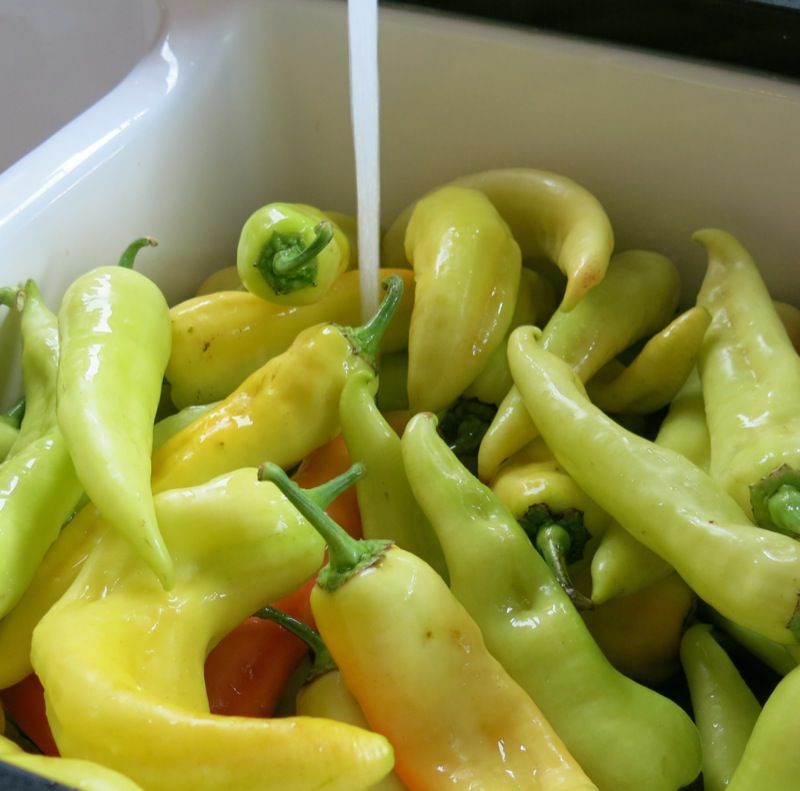 “They have more flavour.” There were some green peppers in the box at The Italian Centre, but most were turning yellow, then orange, then red: each at different phases of the ripening process. Yet, they were crisp, and firm, and fresh and oh, so fragrant! Irresistible. We would make them green next year, when we grow our own. 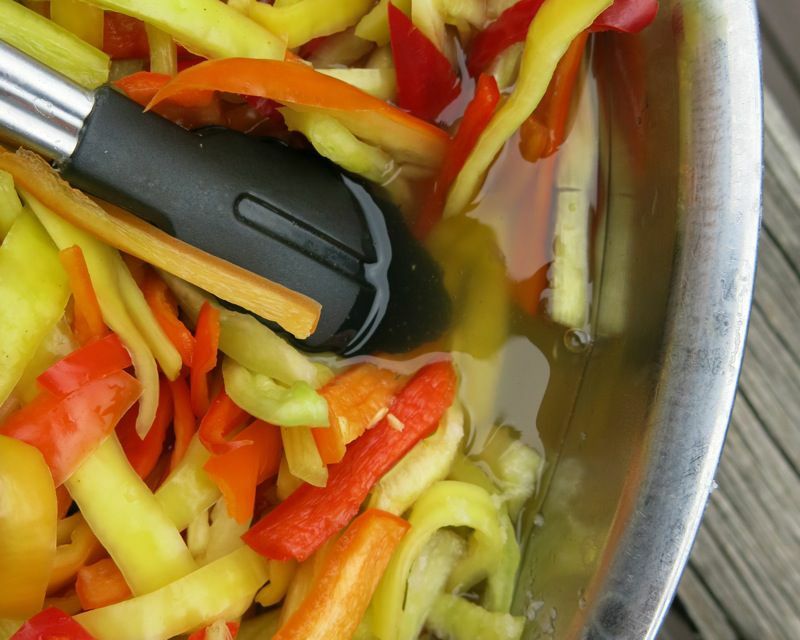 We enjoyed our time slicing the peppers. Even as it took hours and hours. 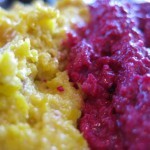 This is why these kinds of preserving activities are family activities in Europe. Everyone knows how time consuming this work is, yet it is so enjoyable when everyone visits and laughs around the table while the work gets done. I have a lot of experience doing this kind of work with Vanja’s family when we visit during the harvest season. I look so forward to it! 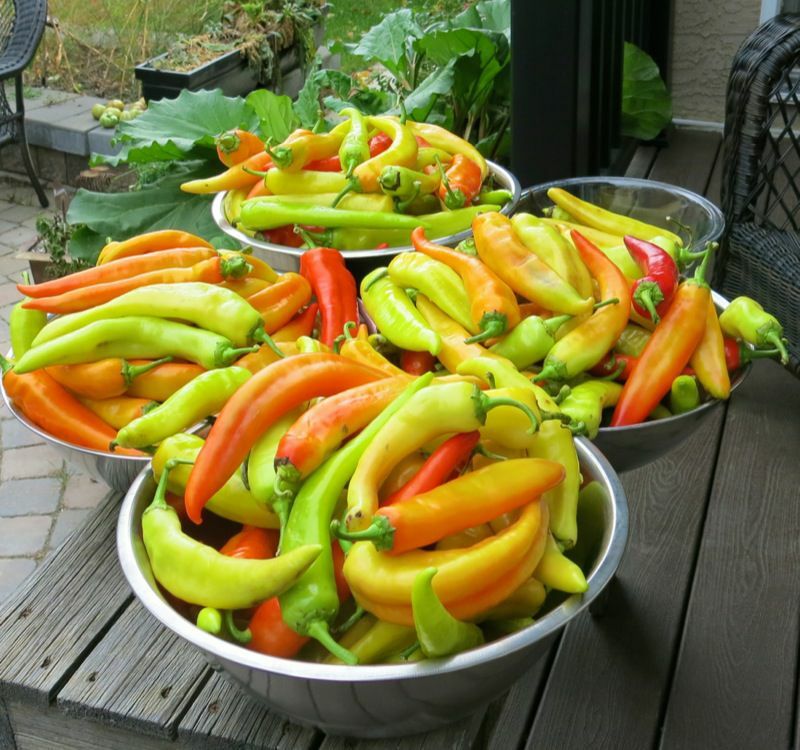 The first day, we washed and cut all of the peppers, then salted them and let them sit overnight. We were both shocked at how much liquid the peppers expelled. We had 2 huge silver bowls of sliced salted peppers and one half full the first day. By the evening, without expelling any liquid, the pepper slices were all moved into one bowl. Above, you can see the amount of liquid acquired through the salting process. 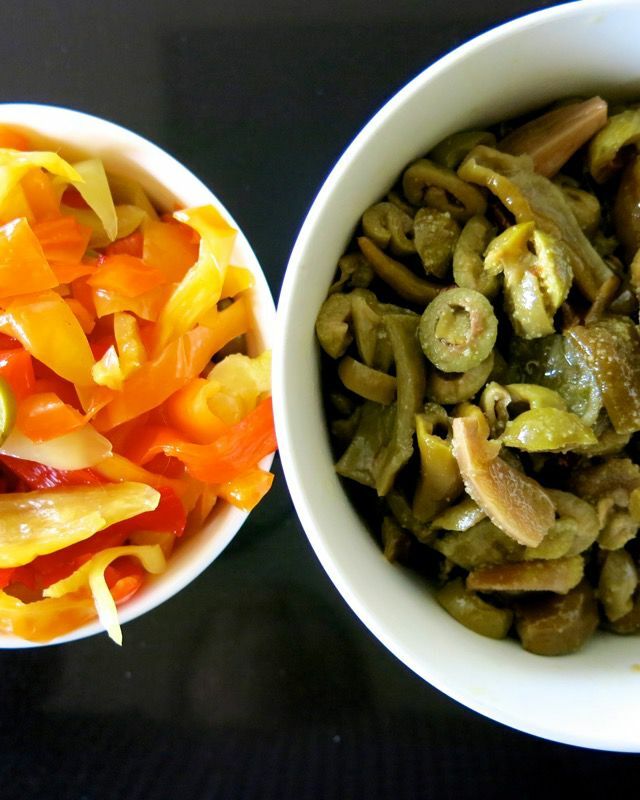 There are 5 kilos of pepper slices in the silver bowl and 4 sliced hot peppers in the little jar. At the Italian Centre Shop in Edmonton, these are called Sweet Banana Peppers and Hot Banana Peppers. The hot peppers were about as hot as I would imagine a habanero pepper to be. Luciana and I were in serious pain after tasting them. Therefore, we salted them separately. Above, I used my tami (flat fine meshed sieve) to strain and wash the salted peppers 24 hours later. I washed them well a couple of times, and used my hands to ensure they were well rinsed. 4. Slice each half in thirds 5. 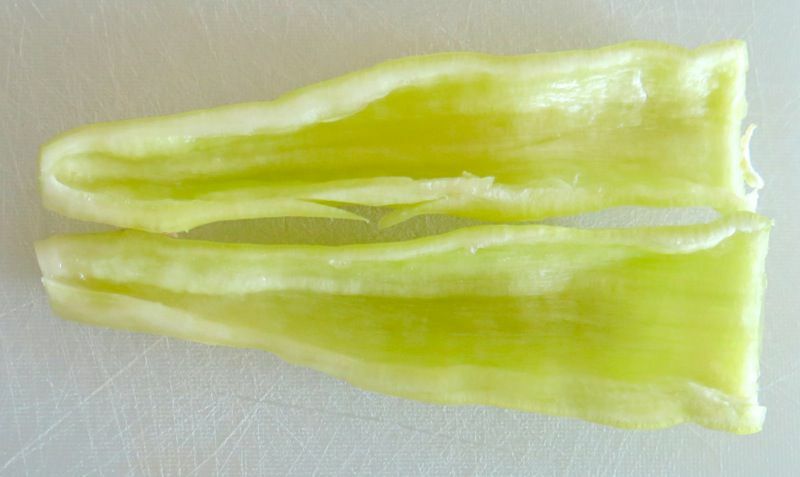 Do not slice each section as the peppers curve 6. 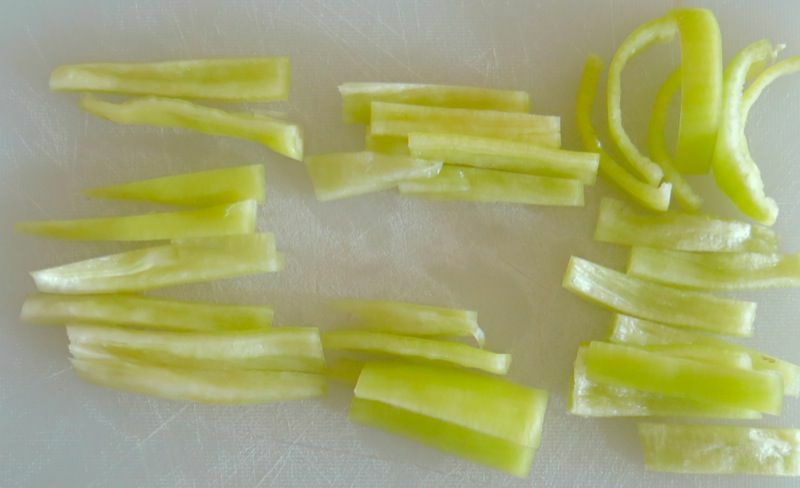 Slice each section along the straight side; can you see the difference? First day, we sliced the peppers and salted them; second day we rinsed the slices really well, then put them in a vinegar water solution for another 24 hours. 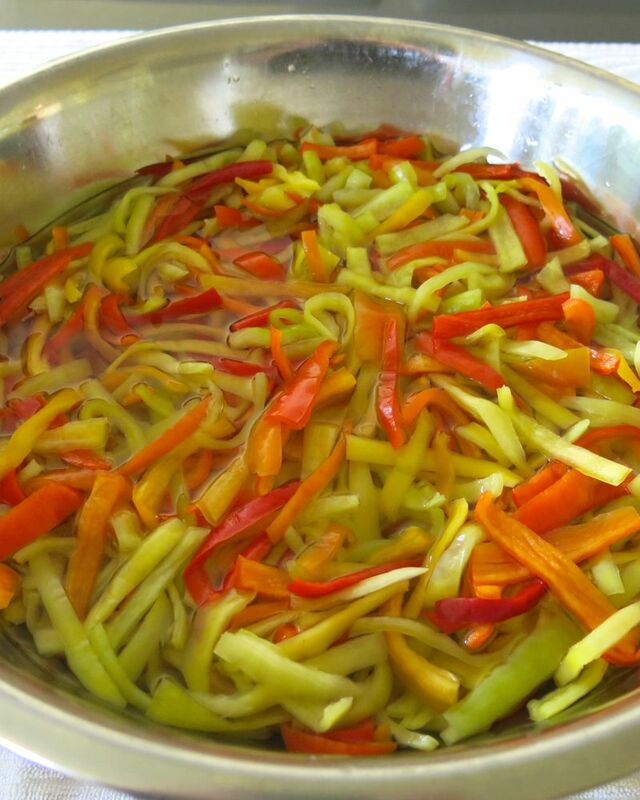 After salting a large bowl, within an hour, we couldn’t believe how the peppers had reduced. It also happened, as you can see, above, with the vinegar, but not so dramatically. This surprised me. I thought the peppers would swell when soaked in the vinegar, yet they shrunk a little more. 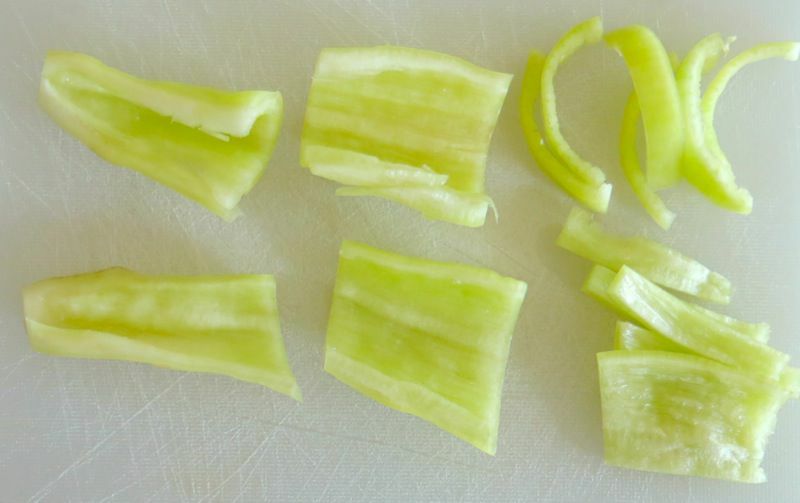 Above, is the entire case of sliced peppers at different phased in each bowl. 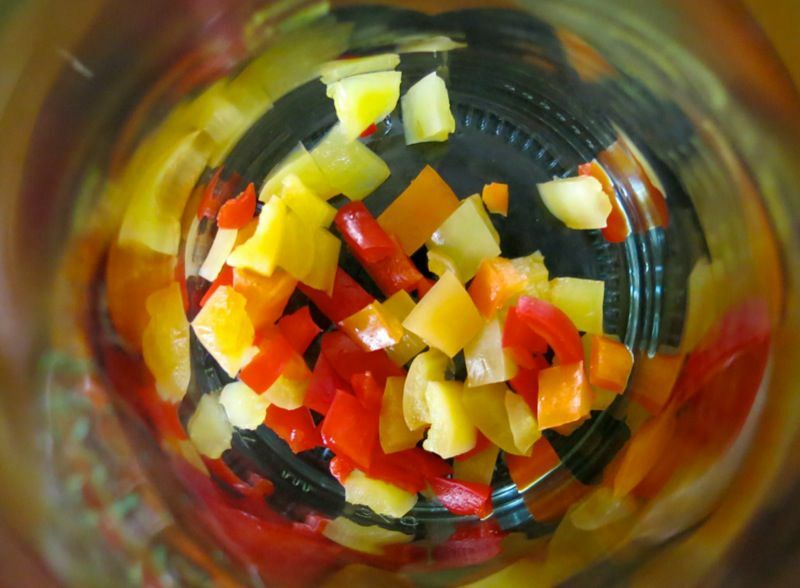 The third day, the vinegar solution must be drained from the pepper slices. 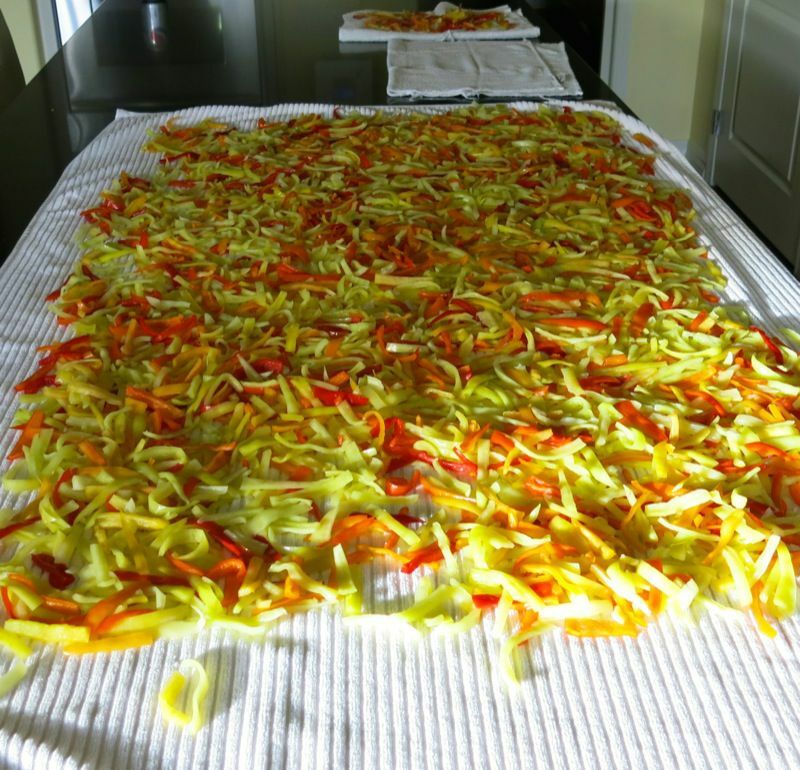 The peppers are to be laid out on a large flat surface to dry. That probably works really well in Puglia in the fall where it is still very warm. Not here. 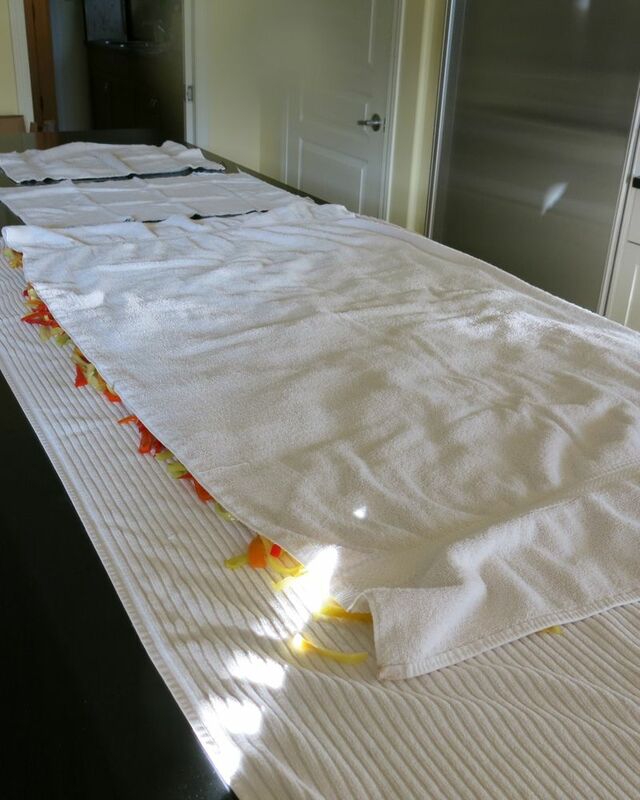 I put another towel on top, rolled the peppers up from the short end, like a cinnamon roll to blot the moisture from them. I used fresh towels and did it again, but with paper towel portioned on top of the peppers. That worked very well. They still felt moist to touch, but were far from wet. 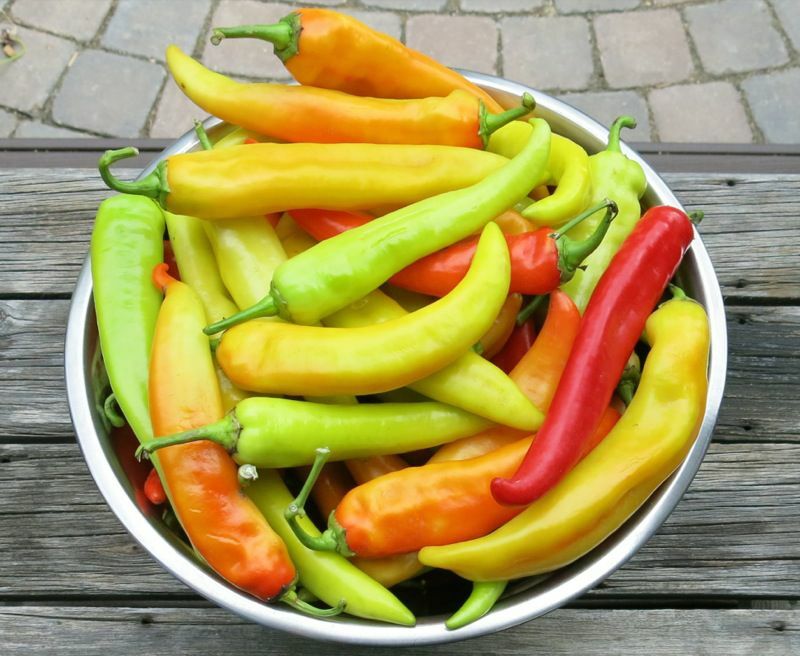 The hot banana peppers were so extremely spicy that we decided to dice them and put one or two squares in a bottom of only a few jars for that added hit of heat; however, once cured with the salt and the vinegar processes, the heat had virtually dissipated. 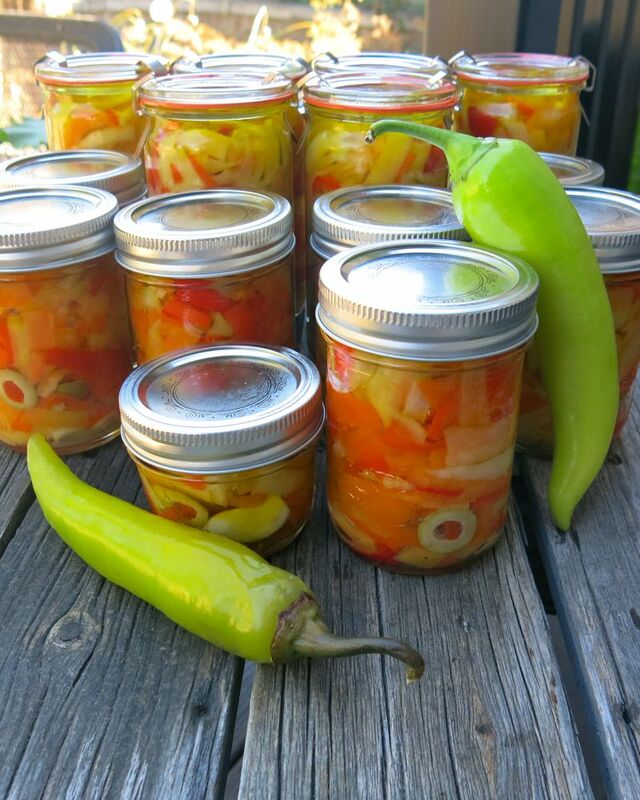 We were to add a few hot peppers to the mix as this preserve traditionally has a mild hit, so what happened? 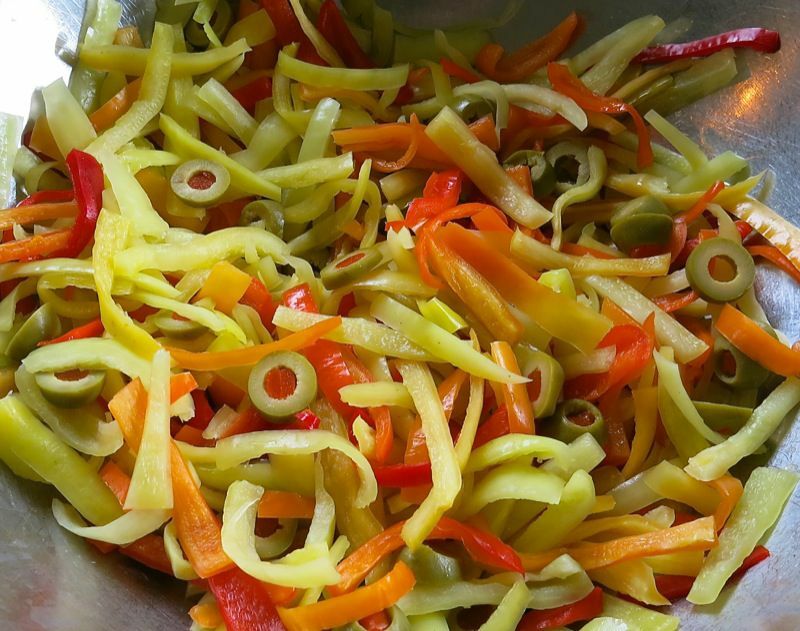 Tony, Luciana’s dad, told her that years and years ago, they used to make the giardiniera with other vegetables, but over time, everyone just liked the peppers in it the most, so that is how they make it now. 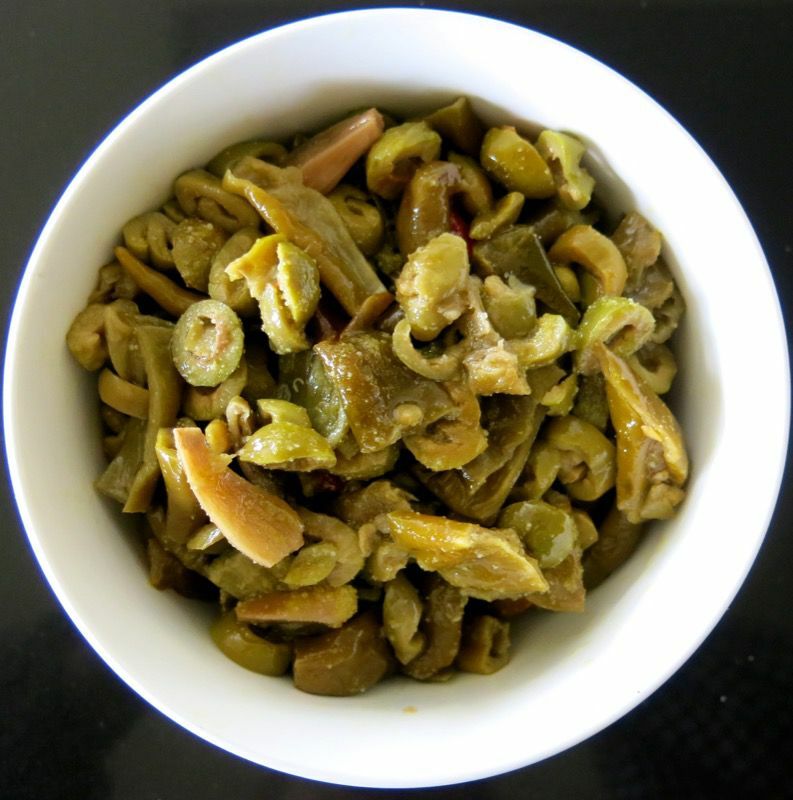 He does add some sliced green olives, however, to “add a little more flavour”. The ratio of 10 to 1 seemed visually sensible when adding olives to the pepper slices: I kilo of pepper slices, 100g olive slices. Yet, that was just too many olives. By about double. Keeping them separate and sprinkling the equivalent of two or three into each jar, depending upon the size of the jar, worked best. 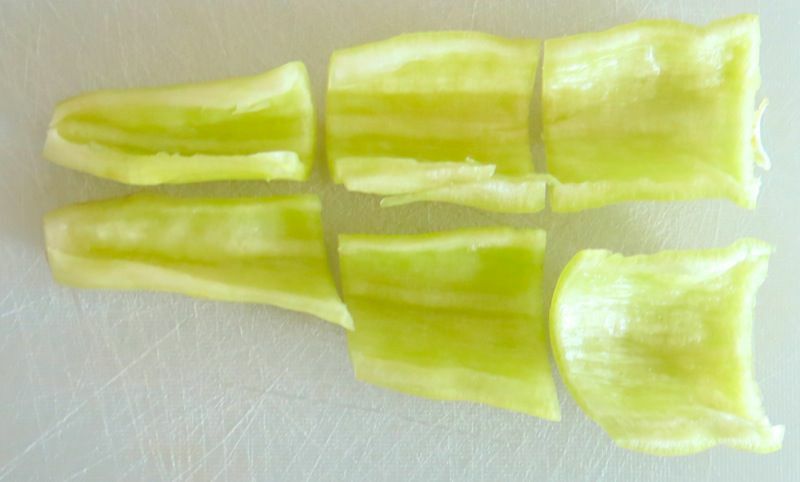 The actual ratio would be a little less than 0.5 to 1: olive slices to pepper slices. 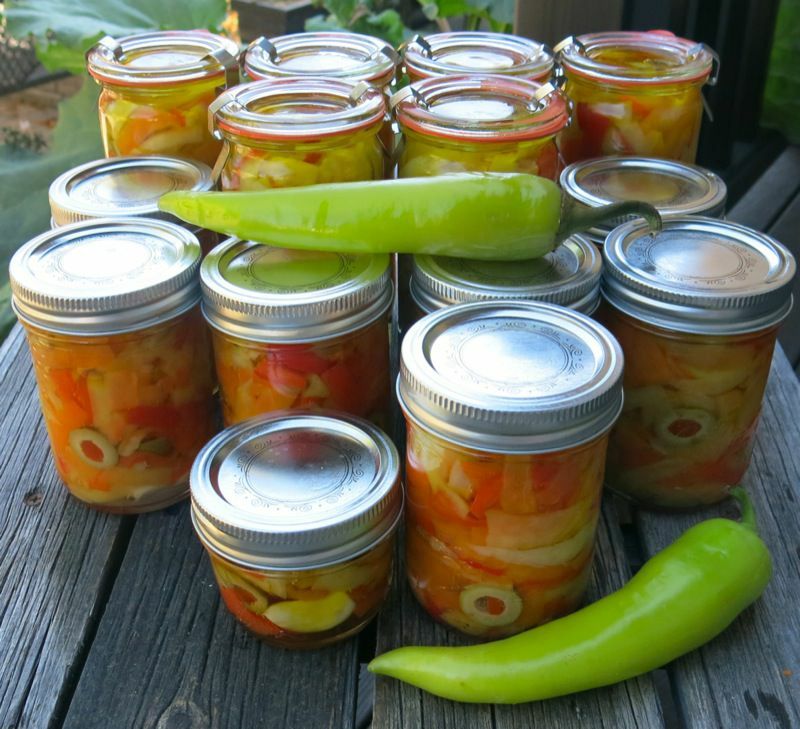 Two teaspoons of the “hot peppers” went into the bottom of some jars; all of the little jars had a large clove of garlic added to each. Tony is 93 and one time he told us no garlic with passion; the next, he asked, “Did you remember the garlic?” This will be sensational with or without garlic, but I recalled it having garlic. For me, everything’s better with garlic. The Weck 1/4 litre cylindrical jars were so pretty, yet impossible to press the ingredients tightly into the jar by hand. Thus, my small rolling pin. It worked wonders. I didn’t break the fibres of the peppers; simply really pushed the slices into position to avoid air pockets. Though I had dried the slices as best I could, even blotting and rolling with paper towel, there was still a considerable amount of juice exuding from the strips as they were pushed into the jar. “Considerable amount” is a relative thing. Not very much really, but some. 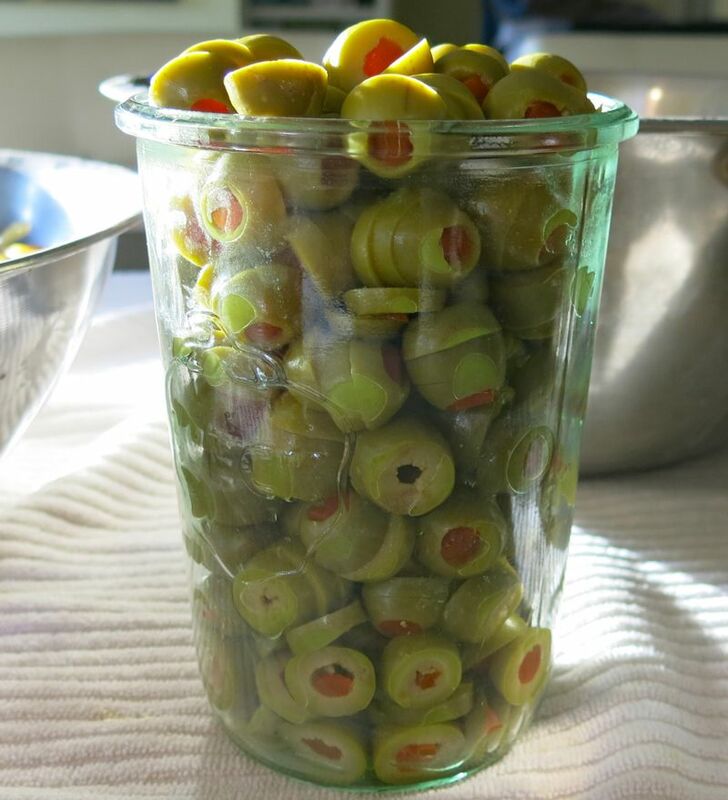 Once I pushed them down into the jar in thirds, I rolled up a ball of the dampened paper towel I had used to blot the strips, and pushed it into the top of the jar to soak up the juices which would, in turn, enable room for the olive oil in the jar. I did this for each jar with a clean paper towel piece. It worked like a charm. Actually, the juice soaked into the towel was about 10 grams as I weighed each jar. The tall jars each weighed 22o grams, and with the pepper strips and olives in them, without the oil, each weighed 550 grams. 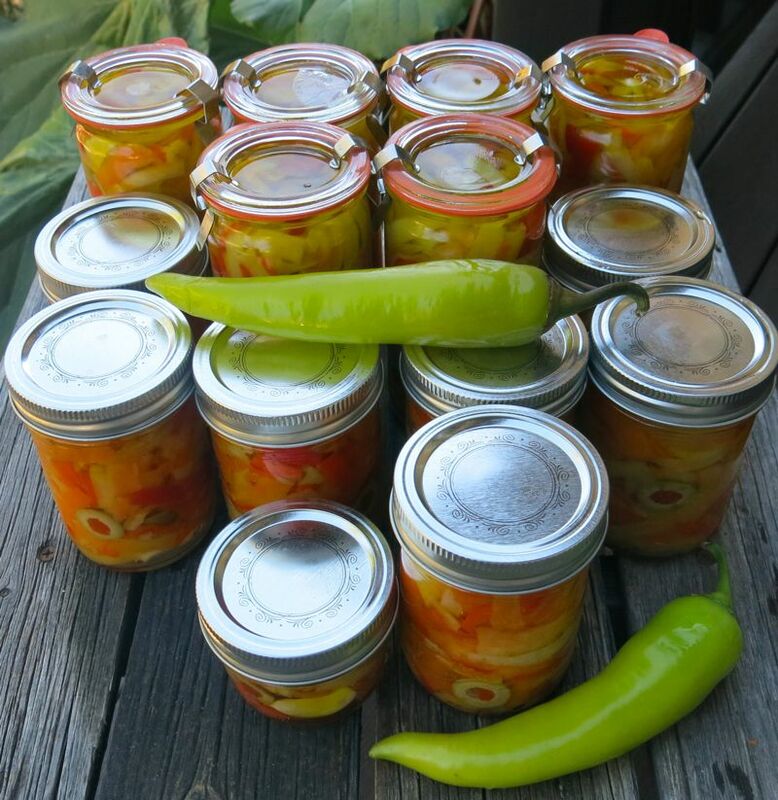 With my elementary school math securely under my belt, each tall jar contains 330grams of giardiniera. That would make almost 26 large jars according to my initial weight of the pepper strips before salting at 8.5 kilograms. 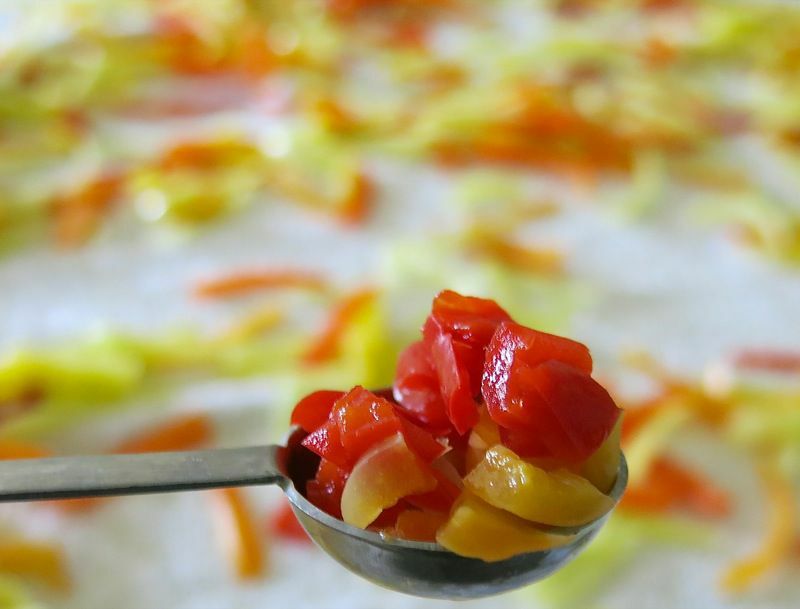 However, after the salting and vinegar process, and after blotting the strips dry, we gleaned 6,55 kilograms of pepper slices ready to pack into the jars. 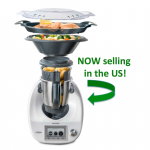 With 330grams per jar, that would enable almost 20 of the tall cylindrical jars. We had 12, so I made 12. The small jars weighed 180g each and I filled each to 390grams, including the weight of the garlic and the olives. Fourteen small jars were filled with 160g of pepper slices remaining. 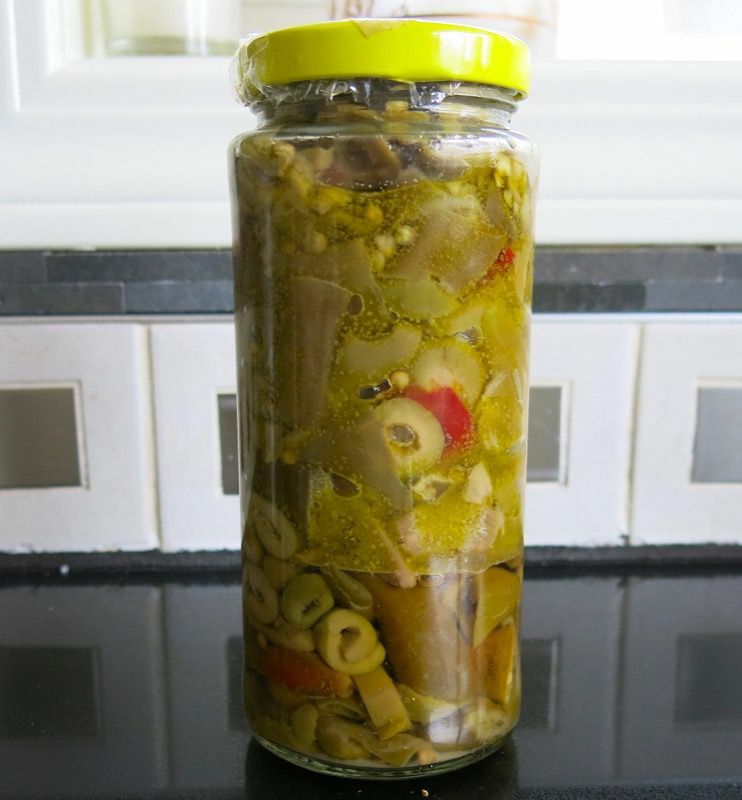 Two 100mL jars were filled with garlic, olives and 80g of pepper slices each. Using smaller jars certainly increased my feeling of productivity! I had packed the pepper strips into the jars so tightly, that the olive oil poured into the top did not seep down between the slices to the bottom of the jar as Tony had said it should. That would be fine for preservation purposes, as long as the oil was on top and air wasn’t touching any part of a pepper. Yet, for optimum flavour, I did encourage a little oil to seep through each jar. 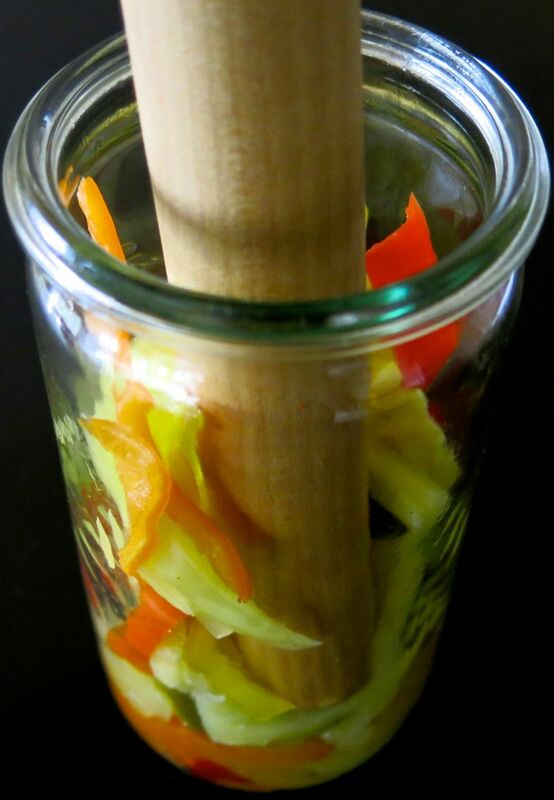 Using a long wooden skewer, I carefully forced the point toward the side of the jar to not engage, gorge or damage any pepper strips. Once it was almost down, I eased the top of the skewer back toward the center of the bowl, keeping the tip against the side of the jar. This created a tiny air pocket for the olive oil poured into the top of the jar to seep into. I repeated this into each of the 4 quadrants of the jar. After doing this, there was no more oil on top of the pepper strips, and they must be pushed down into the jar once more to ensure no ends are sticking up. More oil is then poured on the top to completely enclose all of the peppers. This is a very important part of the process to avoid contamination. 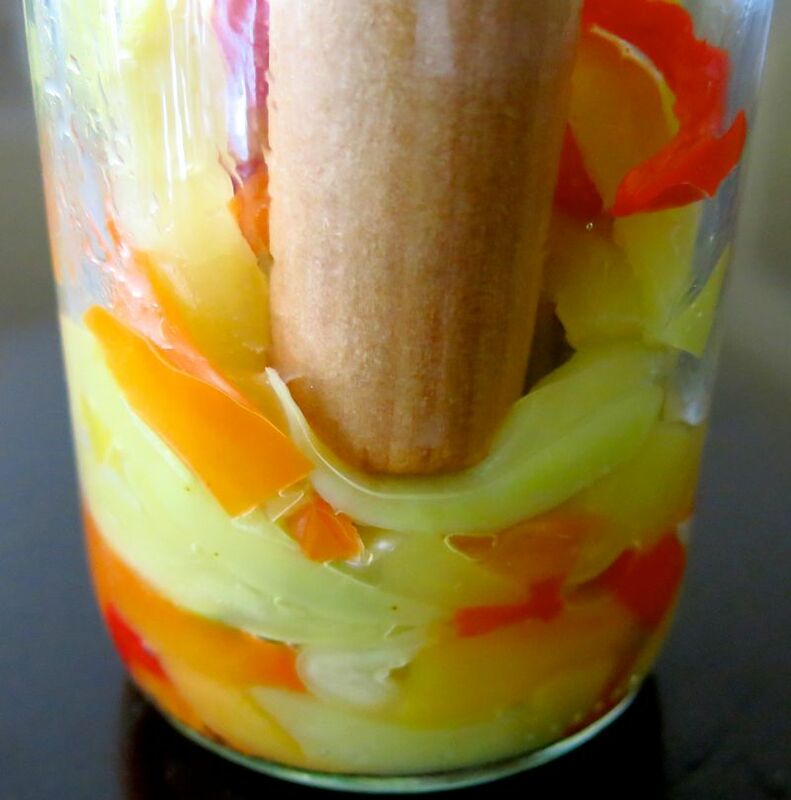 You must leave enough room at the top of the jar for the glass to dip down, if it does, to avoid overflow; at the same time, you do not want an air pocket to exist between the top of the oil and the lid as the ingredients could then shift, during movement, and uncover a pepper strip. The oil has to be completely covering all, and the lid snuggly in place. Above, and below is half of the batch. 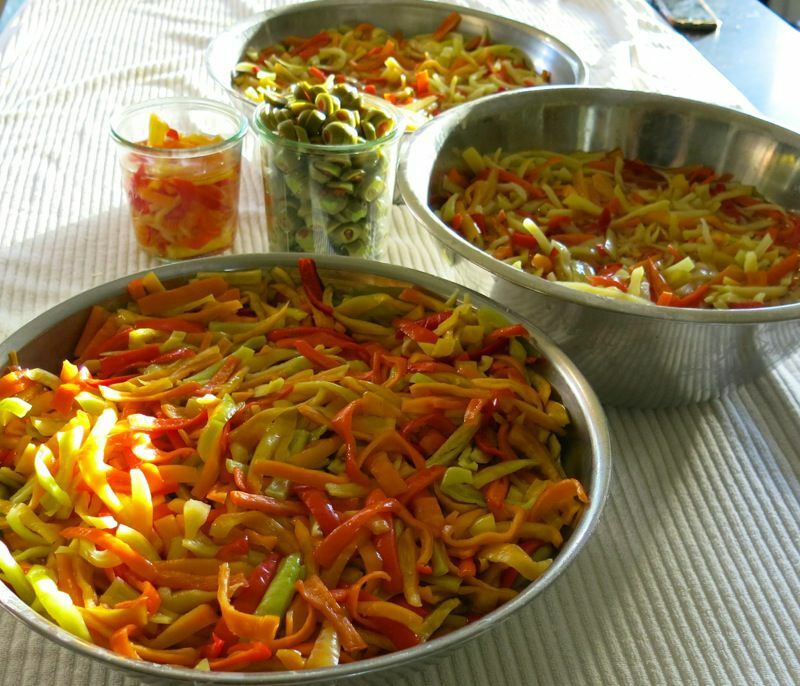 Each of us gleaned this amount of Giardiniera . Let’s do the math. This took Luciana and I, working steadily, though not fast, 7 hours together just to slice the peppers. That is 14 single person hours. It took me a half hour to strain the salt and put all of peppers in the vinegar water solution. Then another hour to dry and blot all of the pepper strips and 90 minutes to press the pepper strips into the 28 jars. That is 17 hours to make this food for our Winter pleasure. No wonder her parents were so “stingy” with giving it out! This is absolutely precious, labour of love merchandise.To make the math easy, if the 27 jars were all the same size, that would be 40 minutes of time per jar, not including cost. The cost was 70 dollars for all ingredients, oil, etc. used. That is $1.07 per each 100grams. 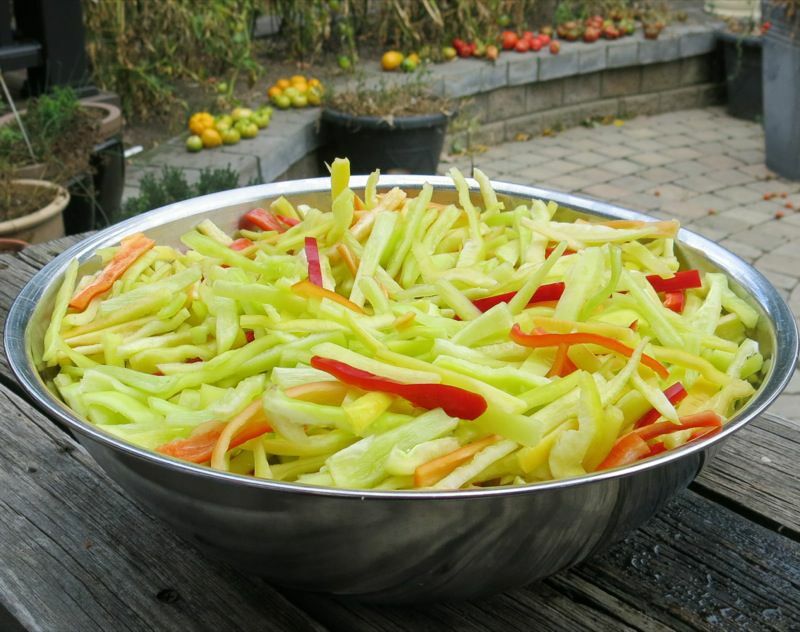 There was a time when preserving beautiful garden vegetable in this manner would be one of the only ways to get proper nourishment through the cold months. The tradition continued as the preserving recipes were so delicious….And now, because these are the jars that preserve the memories of our past and connect us to those that came before. These traditional foods and recipes are the ties that bind families – and friends – together! 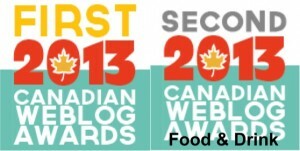 Now, the ultimate challenge: in four weeks, Tony and Vittoria will taste and provide advice. The first difference is huge. 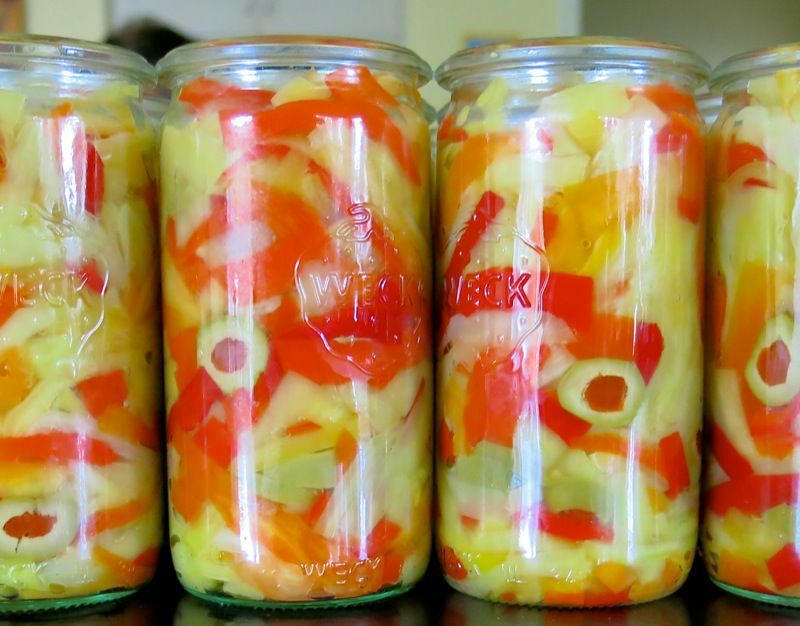 Visually, these look nothing like his vibrant green jars of giardiniera. “Well,” he said, after we told him this, “It’s all in the taste. That’s what makes all of the difference.” Watch for the Giardiniera Sequel: Seeking Tony’s Approval! 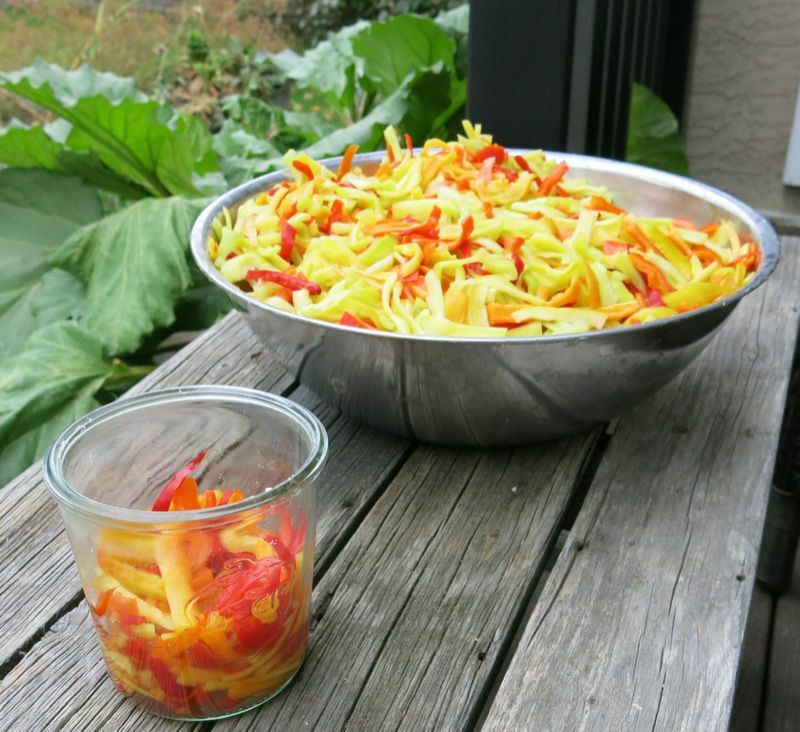 This recipe yields approximately 6.5 kilos of sliced peppers to pack into jars from a case of 15 kilos of peppers. 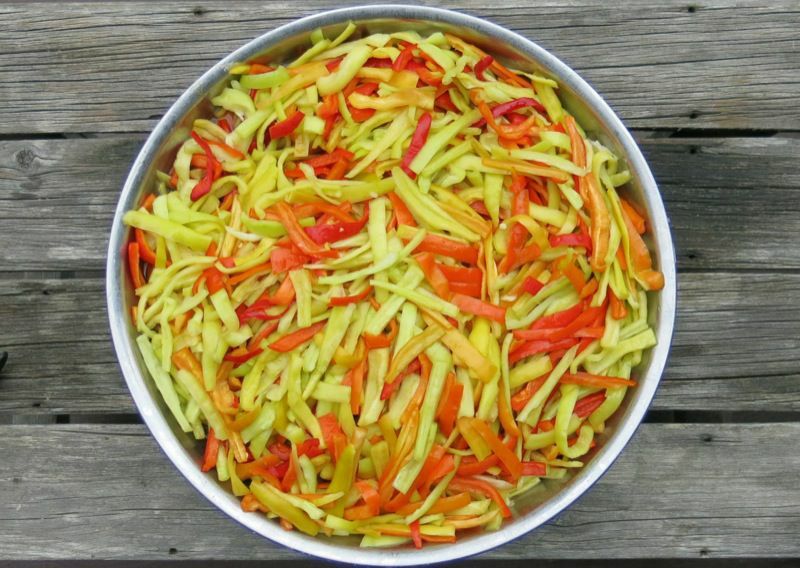 One case of peppers made 8.5 kilos of sliced peppers; after salted, vinegared, and blotted dry, the yield was 6.550 kilos of sliced peppers. 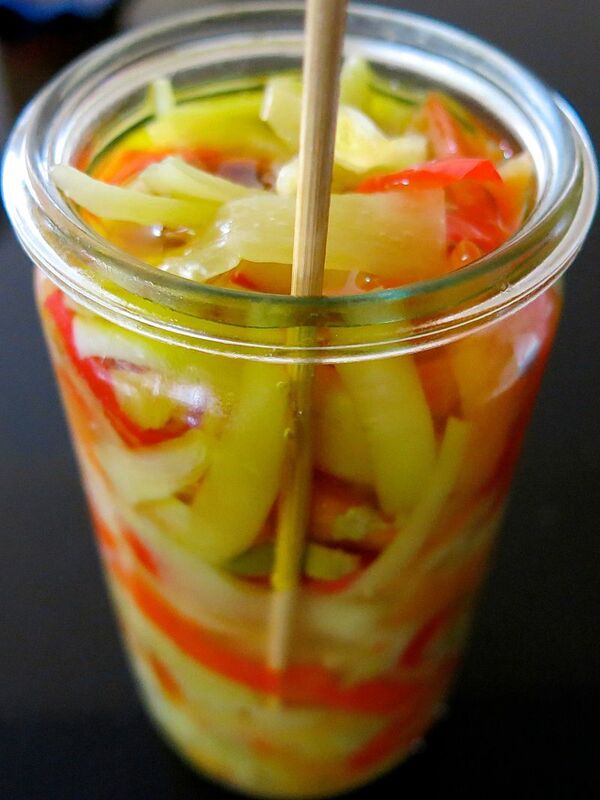 The fragrance of the peppers in the jar is as fresh as the day they were plucked from the bush! These preserved beautifully. They are crunchy with a bit of a kick, just enough for my timid palate. 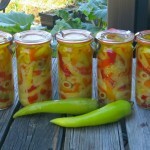 Vanja has already devoured three jars and said, “I love them. These remind me so much of the winter salads mom used to make back home!” Remember, Vanja is not quick to praise anything. I love them, as well. 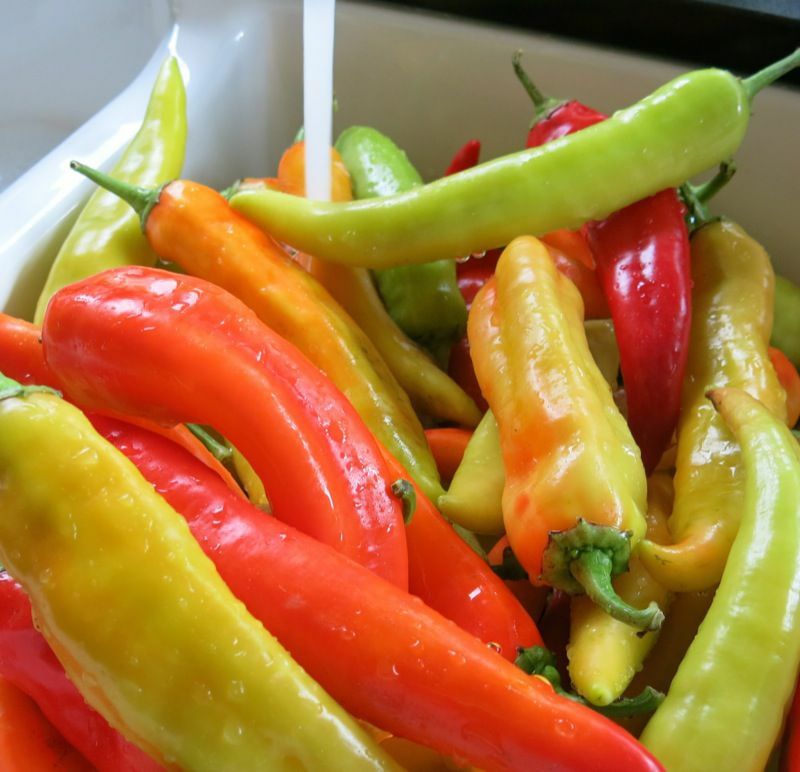 They are fantastic to eat from the jar, as a salad or as a condiment. However, I knew they were not visually close to the Donadeo’s. As well, they were crunchier than I recalled with a distinctly vivid and pronounced pepper flavour white the Donadeo Giardiniera that I recalled was more briny, toothsome, but not crisp. See the difference? Tony harvests his peppers green, before they ripen and that is a significant difference visually. Also, you can clearly see he adds far more than a few olives. 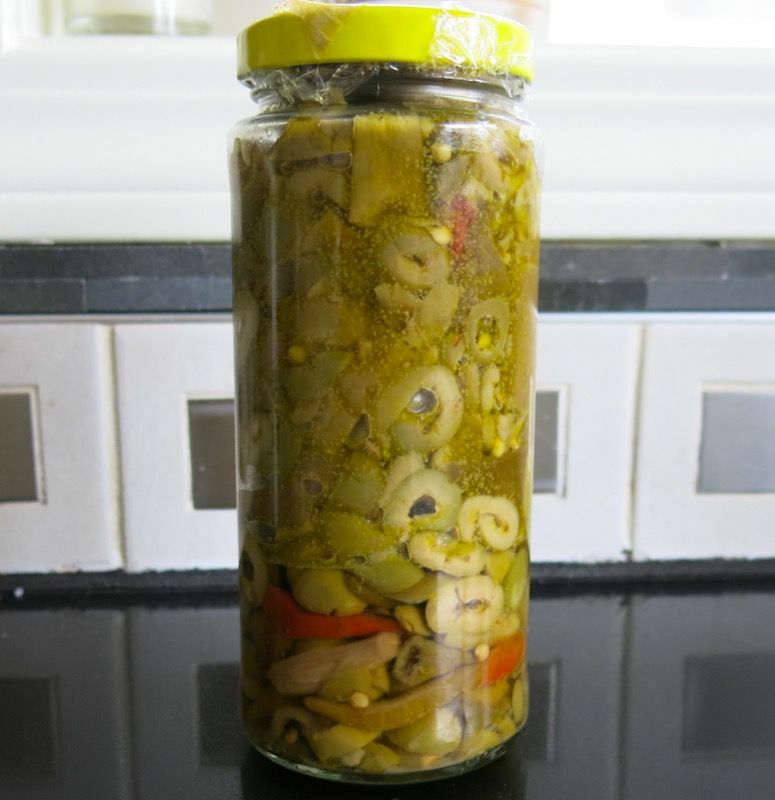 After investigation and disecting the ingredients in the jar, there is a 2:1 ratio, peppers to olives. That is a lot of green olives and the peppers do tend to acquire a very briny flavour similar to the olive. Distinctly different enough, as there are so many peppers, but in this comparative tasting, Tony’s Giardiniera would be considered very “olive-esque”. Let’s keep in mind that ours was one month preserved, and his had 4 months of preservation which could most definitely affect the texture. 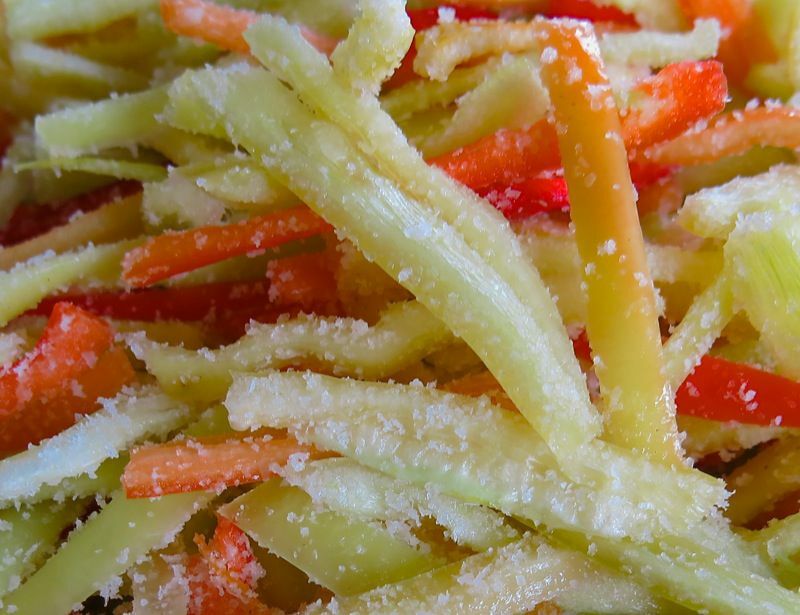 The texture of Tony’s Giardiniera was addictive. Vanja and Ramona preferred the crisp bite of our batch, yet I preferred the toothsome give of Tony’s batch; they were more meaty in texture. And, they contained considerably more oil. 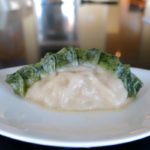 The unctuous silken salty dressing is simply irresistible. 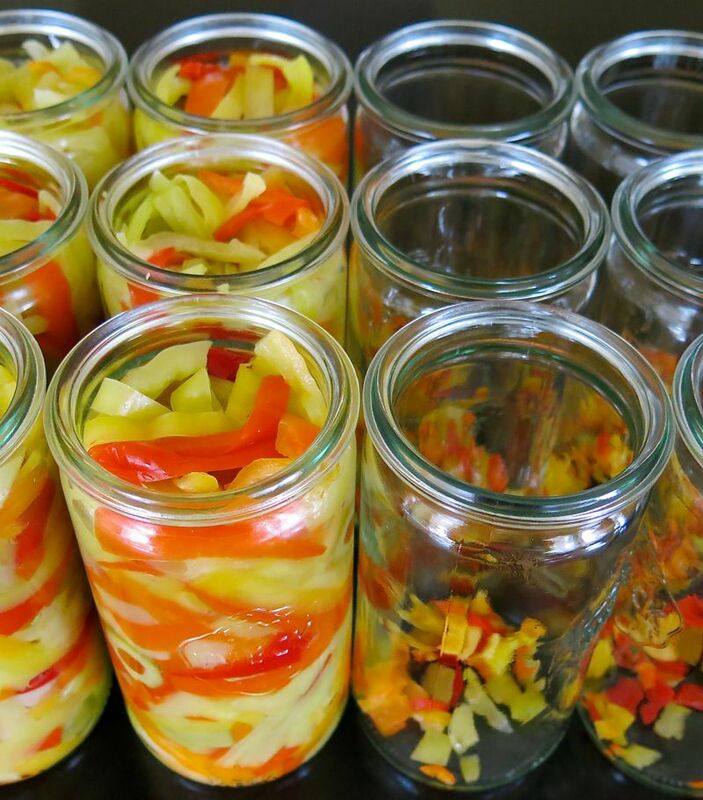 Take a look at Tony’s Giardiniera. Do you see what I see? Yup! That is garlic in the bowl above. Tony had about 3 good sized cloves of garlic in this one jar. 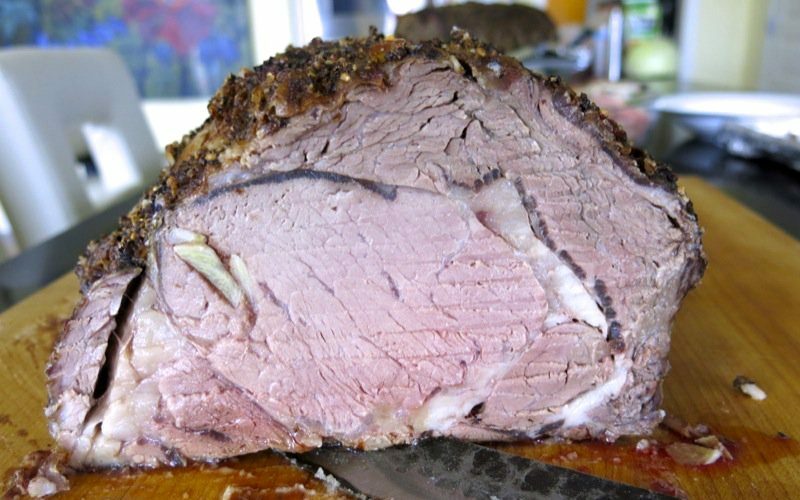 And you can see that they are cut very rustically. In Italian, the word for that is tagliati grossolanamente. 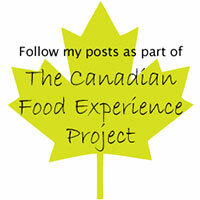 I am a bit of a control freak when it comes to preserves or any kind of cooking preparation. Luciana and I sliced the peppers fairly evenly. We weren’t aiming for perfection as we wanted the preserves to appear rustic and loose, but we definitely were in control of the slicing and the variance of size. It was very labour intensive and Vanja suggested that next year I do ours in quarters or eighths. 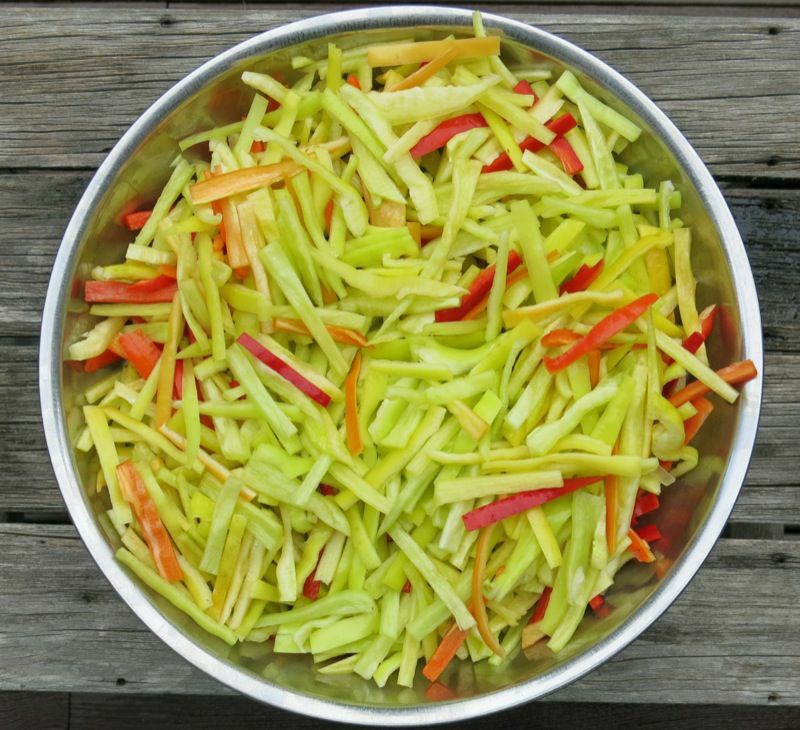 His mom makes a very similar recipe and she cleaned the peppers and then sliced them only so they would fit flat to be salted and vinegared and then to fit in a much larger jar to be used in a variety of winter salads. The garlic is much more visible above. Tony always added a red pepper or two for heat. 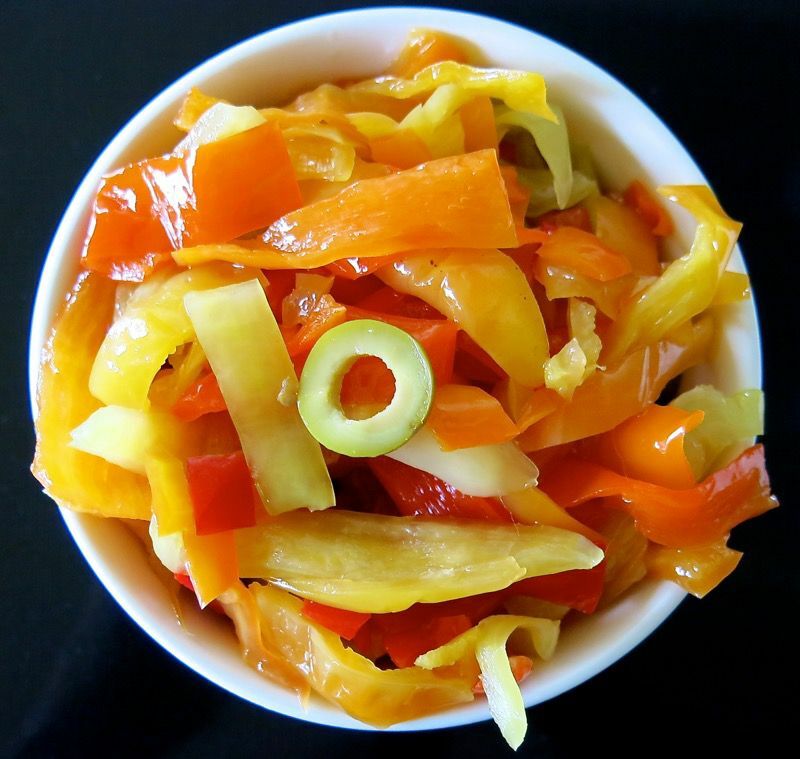 It is the end of the peppers where the pepper flavour sings in Tony’s Giardiniera. I was hoping to capture photographs of Tony and Vittoria tasting our Giardiniera this fall and hearing his comments about it. I wanted to record a video of his impression to include so you could meet him and love him as all who know him do, yet this wasn’t possible. It is my hope that Luciana and Lorenzo will do this over the holidays, send it to me, and allow me to post it. 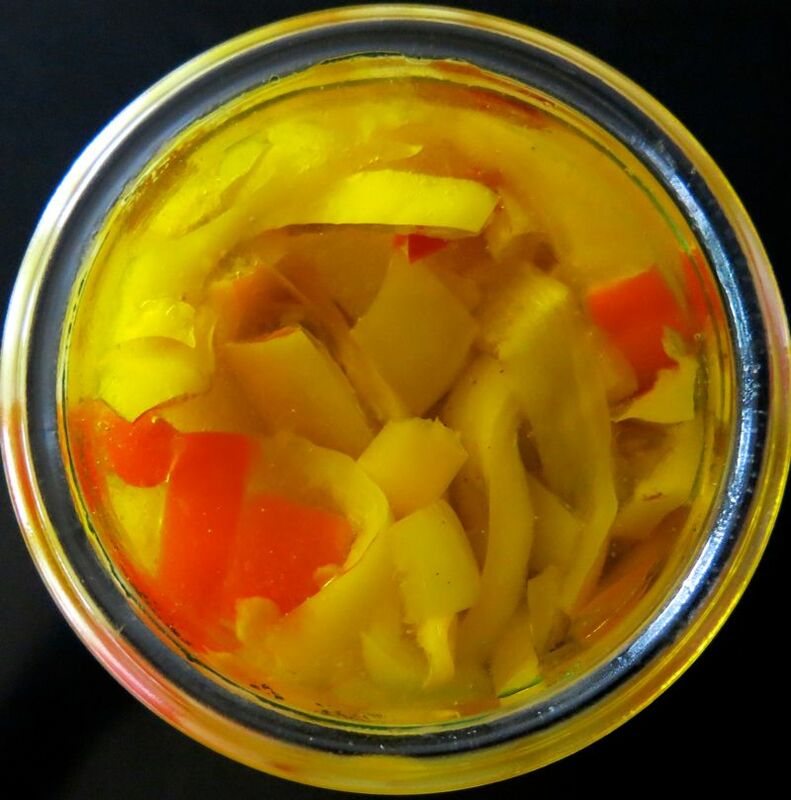 For now, the story of getting this precious jar of Tony’s Giardiniera is still worth telling. Luciana visits her parents almost every week, and was down right after we made these. Tony lept up to fetch a jar from his cold room in the basement for her to see. “You take a picture for Valerie.” “You tell Valerie this is how they look.” Luciana was really surprised at the marked difference in the batches and really wanted a jar for us to taste. She didn’t ask, but it was clear she wanted one. Vittoria gave Tony “the look” that clearly directed him to give his daughter a jar of the Giardiniera for heaven’t sake! (She is working at duplicating the recipe for the family cookbook; it would be the least you could do!) 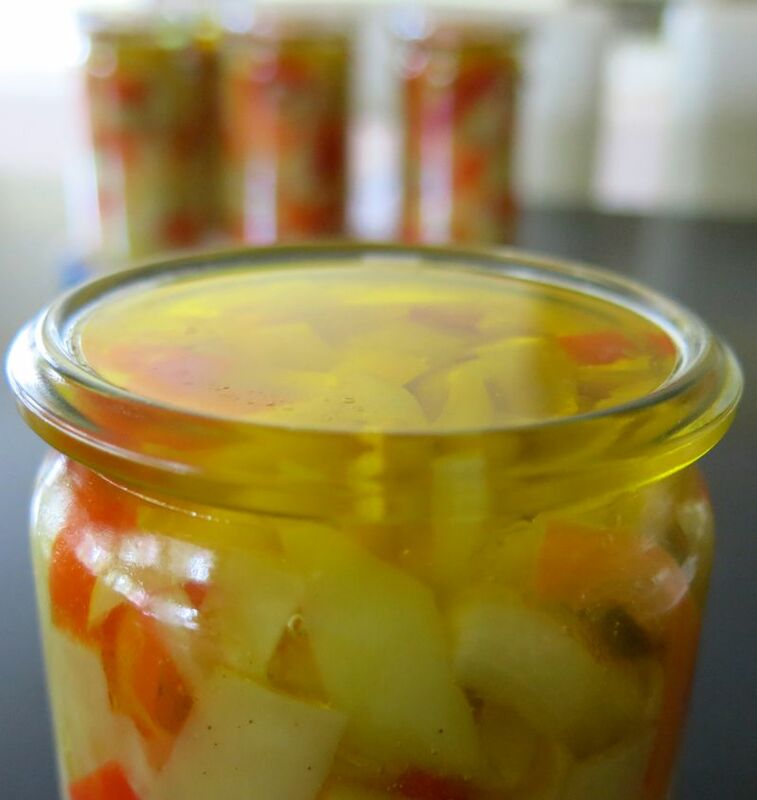 He looked back at his wife of over 65 years, then at his beloved jar of Giardiniera and said to Luciana, “I would love to give you a jar, but I don’t have very many. You just tell Valerie.” And he returned it to its rightful shelf in the basement. Luciana felt that, “I need, I want, I must have.” desire burn within that we all know all too well. How hilarious. She plotted for a reason to go downstairs. She found a button off of her mother’s sweater and took it from her to sew back on. “I’ll just run to the basement to get thread that matches and be right back.” Off she went, straight to the storage room thinking, if dad only has a few jars, I won’t take one. And, behold, there were at least 24 jars there. She was indignant. “Hrumph!! !” Quickly stashing one from a back row under her mother’s sweater, she moved the jars around so it wouldn’t be missed, grabbed some thread and was back up in a flash. And the guilt. She felt flushed, beet red and wondered how her parents missed the lump under the sweater and her sneaking it into her purse. She sewed the button on her mother’s sweater and couldn’t even enjoy the rest of the evening with them, she was so guilt ridden. But not enough to put it back. 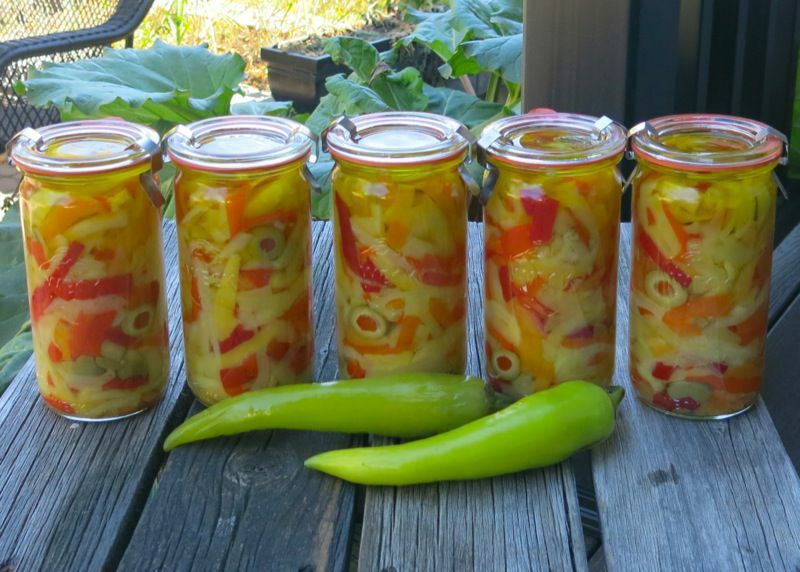 She called me the next day and said, “I have become the thief of the Donadeo Giardiniera! I have stolen from my own parents!” After she told me the story, and was clearly wracked with guilt, we laughed til we cried. And then she brought it to me, but couldn’t stay for the tasting. 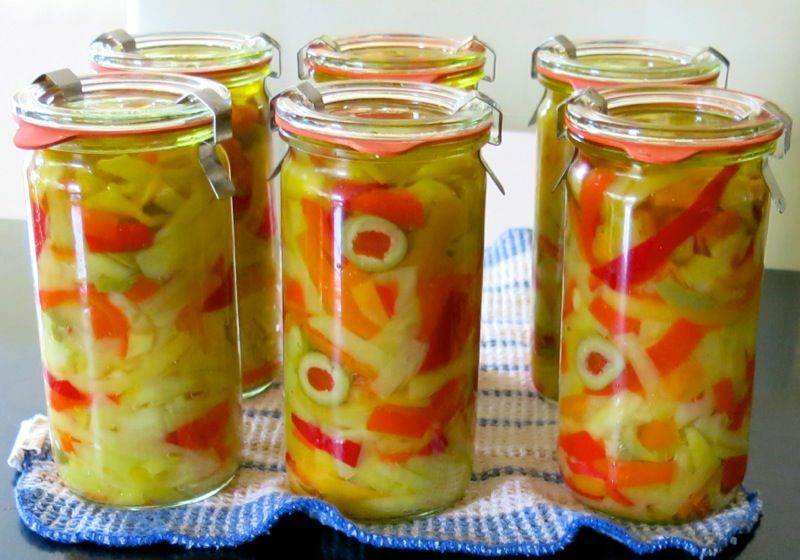 So, we have created an incredibly delicious, nutritious and economical recipe that will be made in my house for generations to come – and we have now discovered the exact method and recipe for Tony’s Giardiniera thanks to Luciana’s evil deed. And so it is. Looking it up, now, Andrés!